Did we just Witness a Transformation in The White House? So the United States has attacked Syria along with the United Kingdom and France and these countries will have to deal with whatever repercussions or benefits as a result. The reason for the attack is unclear with conflicting reports from many different sources. Several well known Trump supporting internet celebrities came out against attacking Syria and provided credible reasons why the Syrian government could not have been responsible for gassing their own citizens who were being used as human shields by the U.S. funded rebels and who, by and large are Al Qaeda and non Syrians. For many who have been following America’s obsession with Syria, it seems clear that America’s hostility towards Syria has much more to do with Israel than it does with America. For decades the American government has been obsessed with regime change in Syria as if Syria was under the control of America and it’s closest allies. It should be noted that the president of Syria is very popular among his own people even after years of fighting off American backed foreign invaders. Donald Trump ran for president as the man who would get the U.S. out of the Middle East by defeating Isis and the man who had no interest in promoting regime changes. Remember what he told Jeb Bush in a debate when he was running about fighting one war at a time? The logical course then would be to finish mopping up Isis and then move on to Afghanistan and finish up whatever the hell we are doing there not start up with Syria. Trump has sent more troops to Afghanistan so it would seem that was at least the original plan. 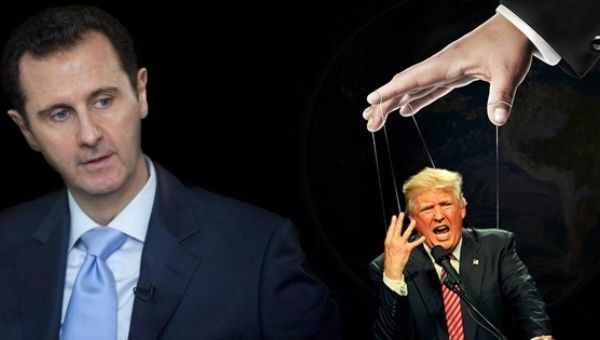 This airstrike seems to go against everything about Syria that Trump campaigned on leading some to believe that Trump has always been a puppet of the powers that be or he was recently turned into one. A body language analysis by Bombard suggests that just prior to the attack Trump seemed out of his element and a bit withdrawn. Did the shadow government finally get to him? If so how? Did they threaten his presidency or his family? Or was this a necessary trade off for some currently unknown benefit Trump has brokered for America with Israel or Saudi Arabia or other entities in the global arena? A former member of the C.I.A. once stated that government was far worse than anything the people could possibly imagine. Well I watch House of Cards so I have a pretty good imagination when it comes to government conspiracy and corruption. So it’s worse than that? Really? It took almost a year before the U.S. military finally admitted that there was no evidence that Syrian’s government was involved in a gassing incident last year which resulted in the United States bombing Syria. Ooops. No sorry. No reparations for the people who died. Just another more powerful bombing on the same kind of flimsy evidence. That doesn’t seem right. The bombing of Syria without a full investigation into the matter and providing that evidence to the American people and frankly the world prior to any retaliatory strike is just plain wrong especially considering America’s role in last years incident. What difference would it really make if the U.S. bombed them last night or 3 months from now? Dragging the UK and France into it to make it appear more legitimate, is like NATO attacking Libya. This kind of foreign policy has to stop.